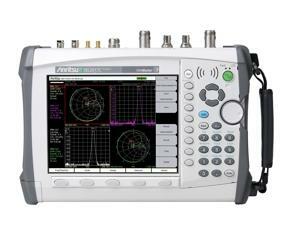 Two new members join Anritsu’s VNA Master series of handheld vector network analyzers, bringing 15-GHz frequency coverage to demanding field applications in such areas as aerospace, defense, SATCOM, commercial wireless backhaul, and research. Both the MS2027C and MS2037C mid-tier models feature a compact design of 8.3×12.4×3.1 in. and are outfitted with an 8.4-in. daylight-viewable display that offers hands-free operation while viewing measurement results. The MS2027C provides frequency coverage from 5 kHz to 15 GHz and specifically addresses complex cable, waveguide, and antenna field-test needs with vector-corrected two-port magnitude, phase, and time-domain or distance-domain measurements. A sweep speed of 350 µs per data point makes the MS2027C useful for filter tuning. Offering the same VNA capabilities as the MS2027C, the MS2037C adds low-noise spectrum analysis for on-site verification and troubleshooting. The integrated spectrum analyzer provides frequency coverage from 9 kHz to 15 GHz and a DANL (displayed average noise level) of –160 dBm in a 1-Hz resolution bandwidth.